The Bentley Mulsanne is one of the best luxury saloons on sale. Part sports car, part limo, the Mulsanne plays both roles to near perfection. 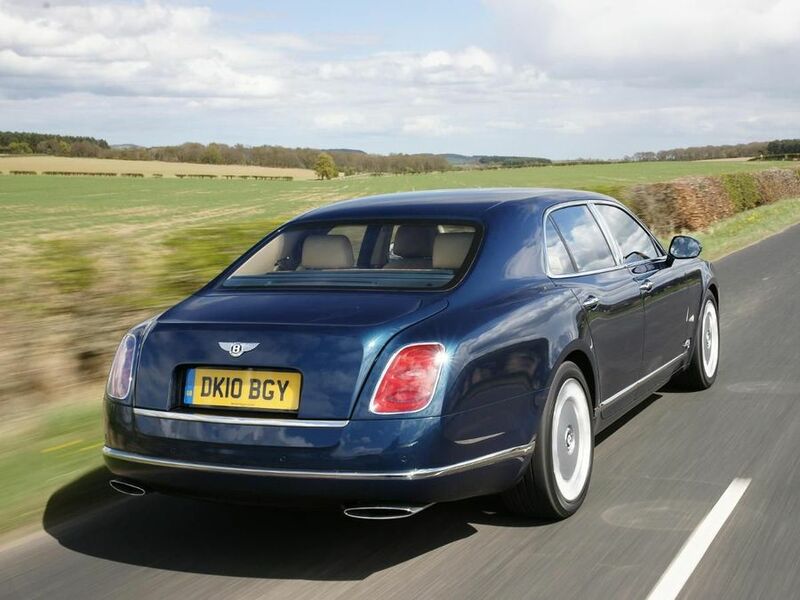 Interested in buying a Bentley Mulsanne? The exterior takes Bentley’s past and mixes in some future design elements. Many questioned the Mulsanne’s styling when it was first revealed. For what it’s worth, we reckon the Mulsanne blends just the right amount of subtle muscularity that’s long been a Bentley characteristic, with some real flair. The cabin is a modern take on traditional Bentley values. The Mulsanne is still a car that many cows have sacrificed their finest hides for. The dashboard is a true work of art, and the entire cabin is ringed by stunning, mirror finished, veneered wood. Combine that with soft leather everywhere else, just enough chrome and some piano black switches, and the Mulsanne feels like it’s worth every penny of the enormous asking price. The controls all operate with solidity and the push-pull chrome ventilation knobs are a tactile treat. The Mulsanne may be a driver’s car first and foremost, but the passengers haven’t been forgotten. The rear seats are as comfortable as a country-house drawing room, and with so much finely finished leather, even the smell evokes old money and traditional craftsmanship. There’s lots of head and legroom in the back, although luggage space could be more generous. There’s some clever technology at work to make this 2.5-tonne saloon behave like a much lighter car. Drive Dynamics Control gives the Mulsanne driver the choice of four different chassis settings. They’re linked to the steering too – Sport adds more weight and firmer damping, a Bentley ‘B’ setting is the best considered choice by the chassis people at Crewe, Comfort brings light steering and a super-soft ride, while Custom allows the driver to tailor the settings to their own requirements. Comfort does exactly as it says, while the Sport setting firms up body control and adds weight to the steering. Tradition runs strong with the Mulsanne, as the twin-turbocharged V8 is still bored out to a familiar 6.75-litres. Despite the tradition, this is no mere carry over from the Arnage. It’s been seriously reworked to include cam phasing and variable displacement – which shuts down cylinders when they’re not needed to improve economy. With 505bhp and a mighty 752lb/ft from only 1,750rpm, the Mulsanne delivers its performance with a mighty low-down surge rather than high revving histrionics. Push the accelerator into the carpet and the Mulsanne will reach 62mph in just 5.3 seconds and keep going until it hits 184mph. Shutting down cylinders when they’re not needed may save some fuel, but the Mulsanne still has over 500bhp and weighs as much as a country home. Expect just 16.7mpg on the combined cycle, and emissions of 393g/km. Then again, if you can afford the asking price, you can probably take the hit at the pumps, too. Bentley’s parent company, Volkswagen, has been keeping a close eye on quality of late, so don’t expect anything major to go wrong. There’s a solidity to everything you see and touch, and the engine has been around in one form or another for long enough to have banished any serious gremlins. The Mulsanne comes with all the modern safety aids you’d expect, like an Electronic Stability Programme and a full complement of airbags. With a car as big and heavy as the Bentley, anything which drives into it is likely to come off second best. There’s a sat-nav system secreted away behind a wooden panel, featuring a 60 Gb hard drive and Bluetooth telecommunication. Bentley has even added a drawer within which you can drop your iPod, MP3 player or phone and connect it directly to the infotainment system. Bentley says the Mulsanne will join at least seven other cars in the typical owner’s garage. It shouldn’t need to, as Bentley’s big saloon does the work of all of them. At £220,000 – that’s just a starting point before you hit the personalisation options – the Mulsanne might look expensive, but consider it as a means for the super rich to downsize and it’s actually something of a bargain.